Preparation time: 5 minutes. Marinating time: 30 minutes. Baking time: 18–21 minutes. 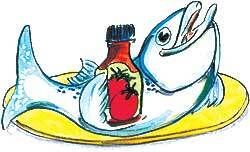 Place salmon fillets in a zip-top bag and pour vinaigrette over them. Seal bag and shake gently to coat. Marinate for 30 minutes in the refrigerator. Preheat oven to 450°F. Coat a baking dish with cooking spray. Place salmon in the baking dish with the skin side down. Pour marinade over salmon. Bake uncovered until fish flakes, about 18–21 minutes (6–7 minutes per 1/2-inch thickness of the fillet). Remove skin and cut each fillet in half. Serving size: 1/2 fillet or 4 ounces.